Michigan ambulatory surgery centers, or ASCs, are facilities where surgeries that do not require hospital admission are performed. ASCs are not rural health clinics, urgent care centers, or physicians’ offices. ASCs treat only patients who have already seen a health care provider and selected surgery as the appropriate treatment for their condition. Michigan ASCs are small entrepreneurial businesses that benefit Michigan communities by providing access to reasonably priced surgical care, but also by contributing to the local property and income tax bases and providing service and contributions to community charities. ASCs are family friendly employers that offer flexible work schedules, and good health and retirement benefits to their trained staffs. Michigan ASCs provide over 2,000 direct jobs in Michigan. The high level of professionalism, quality and safety Michigan ASCs offer is an important reason patients and physicians choose ASCs for surgical procedures. Low infection rates, high satisfaction, and lower costs are among the reasons patients choose Michigan ASCs. ASCs typically cost less than hospitals for the same procedures, saving the patients a significant amount of money. Physicians choose Michigan ASCs because of the low infection rate, quick room turnover, high patient satisfaction, and efficient boarding and scheduling. By providing high-quality health care and excellent service, Michigan ASCs save patients and insurers money. Medicare and its beneficiaries pay an average 54% more for a procedure performed in a hospital outpatient department than they would pay for the same procedure if performed in a Michigan ASC. Some procedures need to be done in the hospital, but many don’t. That’s why Michigan ASCs are positive for the Michigan economy – they provide a high quality, lower cost alternative for Michiganders. 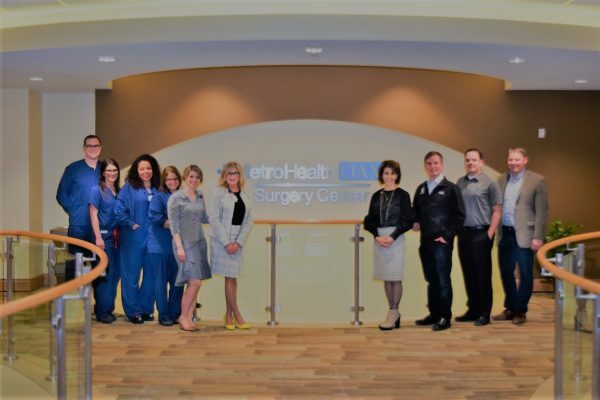 On Monday, March 4th, 2019, the Metro Health OAM Surgery Center was toured by Michigan State Representatives Lynn Afendoulis (District 73) and James Lower (District 70). Also joining the tour were Dan Papineau, Director of Tax Policy and Regulatory Affairs with the Michigan Chamber of Commerce, Ryan Burtka, Michigan Ambulatory Surgery Center Association (MASA) Lobbyist, and Adam Urber, Legislative Director for Representative Afendoulis. Representatives Afendoulis and Lower are the Chair and Co-Chair the Tax Policy Committee for the Michigan House of Representatives. On February 20th, Representative Afendoulis introduced House Bill 4203, with the intent of removing the wording “dispensed pursuant to a prescription” from the State of Michigan tax code when referring to surgically implanted devices. This wording has caused medical implants such as plates, screws, anchors, and grafts subject to the 6% Michigan sales tax since July 2018. It was estimated this additional tax could cost Michigan Ambulatory Surgery Centers (ASCs) several million dollars in 2019. The purpose of the tour at Metro Health OAM Surgery Center (MHOAMSC) was to showcase to the Representatives and guests the quality of care, and level of patient satisfaction, that ASCs offer. In addition, the negative impact on the cost of healthcare that this sales tax generates was discussed. MHOAMSC is an orthopaedic centered facility, providing care for patients throughout Michigan, and performing approximately 5,500 surgeries per year. These surgeries include minimally invasive spine procedures as well as same-day total joint replacements. The leadership team at MHOAMSC was also able to share with the Representatives and their Guests information regarding how ASCs are able to save Medicare and Medicaid money, by providing the same outpatient services as a hospital, but in a lower cost environment. MHOAMSC’s Executive Director, Tina Piotrowski, spoke on behalf of Michigan ASCs at the Tax Committee hearing on Wednesday, March 6, 2019. Ms. Piotrowski was able to highlight the value that ASCs bring to healthcare as well as the exceptional quality of care provided to patients. This is a general and very brief description of the major steps of the legislative process a bill must go through before it is enacted into law. Under the State Constitution, every bill must be read three times before it may be passed. The courts have held, however, that this requirement can be satisfied by reading the bill’s title. Upon introduction, the bill’s title is read a first and second time in the Senate and is read once in the House. The bill is then ordered to be printed. A bill cannot be passed or become law until it has been printed or reproduced and in the possession of each house for at least five days. a. Report the bill with favorable recommendation. b. Report the bill with amendments with favorable recommendation. c. Report the bill with the recommendation that a substitute be adopted. d. Report the bill without recommendation. e. Report the bill with amendments but without recommendation. f. Report the bill with the recommendation that the bill be referred to another committee. g. Take no action on a bill. h. Vote to not report a bill out of committee. While there are provisions in the House Rules and the Senate Rules for reading bills unless exception is made, in practice, bills are not read in full in either chamber. In both houses, amendments must be approved by a majority vote of the members serving and the previous question maybe moved and debate cut off by a vote of a majority of the members present and voting. At the conclusion of Third Reading, the bill is either passed or defeated by a roll call vote of the majority of the members elected and serving (pursuant to the State Constitution, approval of certain measures requires a “super majority” of a two-thirds or three-fourths vote) or one of the following four options is exercised to delay final action on the bill: (a) the bill is returned to committee for further consideration; (b) consideration of the bill is postponed indefinitely; (c) consideration is postponed until a certain date; or (d) the bill is tabled. a. Sign the bill, which then either becomes law at the expiration of ninety days after the Legislature adjourns sine die or on a date beyond the ninetieth day specified in the bill. If the bill has been given immediate effect by a two-thirds vote of the members elected to and serving in each house, the bill will become law after the Governor signs the bill and files it with the Secretary of State or on a day specified in the bill. b. Veto the bill and return it to the house of origin with a message stating the Governor’s objections. c. Choose not to sign or veto the bill. If the bill is neither signed nor vetoed, the bill becomes law fourteen days after having reached the Governor’s desk if the Legislature is in session or in recess. If the Legislature should adjourn sine die before the end of the fourteen days, the unsigned bill does not become law. If the Legislature has adjourned by the time the bill reaches the Governor, he or she has fourteen days to consider the bill. If the Governor fails to approve the bill, it does not become law. a. The Legislature may override the veto by a two-thirds vote of the members elected to and serving in each house. The bill then becomes law. b. The bill may not receive the necessary two-thirds vote and thus the attempt to override the veto will fail. c. The bill may be tabled. d. The bill may be re-referred to a committee. MASA, your association, has the opportunity to participate more effectively in the political process in Michigan. MASA has formed a political action committee, MASAPAC. MASAPAC is the latest tool for our efforts to advance the interests of the ASC Industry. MASAPAC will inform its members about important issues and decisions made by government officials that can affect the ASC industry. The committee will also provide an opportunity for members to jointly support public policy positions that are important to our industry in Michigan. MASAPAC is a bipartisan organization that contributes to the campaigns of state and local candidates. MASAPAC typically supports candidates who share MASA’s views on public policy, serve as legislative leaders, represent districts where MASA has a major business presence, or serve on committees that have jurisdiction over legislation that is important to our industry. I hope you will support your political action committee by making a donation. Checks of $100, $50 or even $25 should be made payable to MASAPAC. Please download the contribution form below. Thank you.